My morning started in all its usual familiarity and chaos. (Peeling myself away from my kids in the morning is something I have not yet mastered since welcoming our second kiddo into our family this past summer.) My husband and I ran around, frantically executing the diaper-clean-clothe-feed-the-kids routine, managing to make ourselves look quasi-presentable, and of course caffeinating. 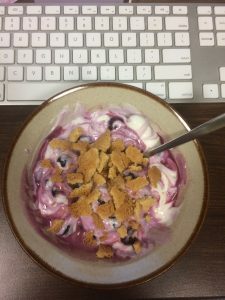 I stared at the fridge for far too long waiting for something to jump out at me saying, “I’m a pre-assembled lunch!” Went with a tub of plain yogurt and some frozen blueberries. Relatively easy to dump them in the only Tupperware with a matching lid remaining in our cabinet (HOW do they lose each other? WHO steals them?). No granola? Darn. No big deal, I will add some honey or something. If nothing else, I am a self-proclaimed meal-improviser. Get outside – oh, hello snow. Broke the snow brush recently, so unlock the other car, grab the brush, brush the car off. Okay, okay. That’s enough. You get the picture – CHAOS. This chaotic, scattered pace is not new for me – or for almost anyone I know. And I don’t think I’m alone in thinking that the entirety of 2017 seemed to take chaos to a whole new level. It seems at every turn there was some chaos that was bigger than my exit from my house each morning – changes at rapid speeds from local, state, and federal government, changes from other systems too – like insurers and healthcare providers. Changes that could impact the nonprofits we fund – and changes that could negatively impact the people that they serve. I am guilty of mostly viewing chaos as my enemy. (Even though I remind myself every day that my personal chaos stems largely from my own good fortune and privilege: I have a job, I have a family, I have money to pay my bills.) I’ve been in a reflective place these past few weeks as one year ends and a new year begins and through this I remembered a book called “Messy” that Tim Harford wrote that is all about the benefits of chaos in our lives. He talks about how there can be great benefits from chaos – namely creative, unexpected outcomes. Thinking big and bold and differently are things most everyone is comfortable touting. But add chaos to the mix and it becomes something we try to control for – in our personal and professional lives. This past year we rolled out a new application, new strategies to support applicants, new strategies to support grantees, and a whole bunch of other little new things. We tried to control for chaos and the unexpected, but we also knew some would come with the territory. We didn’t welcome it, but we didn’t exactly fight it either. It was definitely chaos at points, but some really great and exciting ideas emerged from this year of chaos, like the idea of screening some applications by phone to get a better sense for the request. Or like the idea of holding office hours so that organization representatives can just drop by, say hello, and chat or ask a question. The vast majority of applicants (all but one) thought the new preliminary application was better than the previous. You told us you liked the shorter application and the abbreviated timeline. Those of you who didn’t get funded scheduled follow-up calls with us for feedback. We aren’t exactly sure on the numbers here, but at least 60 of you called us. This is an investment of time on the part of the program officers, but one we think is well worth the effort as we see stronger proposals from applicants in each subsequent deadline. Your comments helped us clarify the language we use in our new application questions, fine-tune our correspondence about screening calls, and think about new ways to communicate with applicants. Throughout this past year, we saw lots of good emerge from our internal chaos, and we know there is more creativity to harness from it. 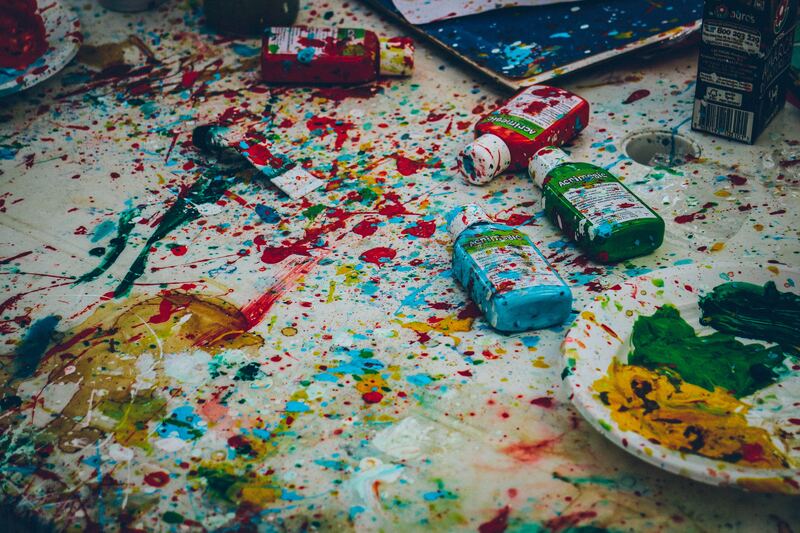 So this year I want to try to look at chaos a little differently – what opportunities could emerge from the chaos that will help us do our jobs better? How can we experiment more – drawing from the voices, opinions, perspectives of our nonprofit partners and the people they serve? If I have to live with chaos, I might as well try to like and appreciate it. When I got to the office and turned on the kitchen lights after my chaotic morning, carrying my yogurt and blueberries to the fridge, there, shining in the corner of the room were LEFTOVER CHRISTMAS COOKIES. Yes. My new plan: yogurt + cookies. Okay so this wasn’t my best, most creative idea to emerge from chaos today (my first was the idea of creating a robotic arm that I use to cut my own hair with using a virtual reality glove), but it was pretty tasty.